Through studies of older events and models of future ones, we find that the problems are only partly scientific or technological. The human dimension, the planning, the response and the social dynamics, often determine the ability of societies to survive the Big One, the natural disaster so large that it threatens the functioning of society itself. This time, the disaster is playing out in Indonesia, one of the most complex tectonic environments at the intersection of four tectonic plates. The sequence this month has been near or on a shallow fault system called the Flores Back Arc thrust. This means the fault is on land and near the Earth’s surface, so people are very near the source of the shaking. If it were offshore and deeper, everyone would receive less shaking. Without earthquake resistant construction, being near an earthquake above magnitude 6 is often deadly. In natural disasters, the poor suffer more than the rich. They are more likely to be in substandard buildings and therefore receive more damage but they also have fewer resources to cope with the aftermath. In Indonesia, we are seeing many collapsed buildings. Buildings can be built to withstand earthquakes but this costs more. The increased costs can be small, but the benefit is hidden until the earthquake occurs. It may take a back seat to immediate housing needs or desire for short-term profits. So far, three earthquakes above magnitude 5.9 have occurred. This type of “earthquake triggering” is also very common. Every earthquake makes another earthquake more likely. About 1 out of every 20 times, one of the aftershocks will be bigger than the mainshock. We then change the name and call the first one a foreshock. Aftershocks will be continuing for months or even years and more of them could be large enough to be damaging. 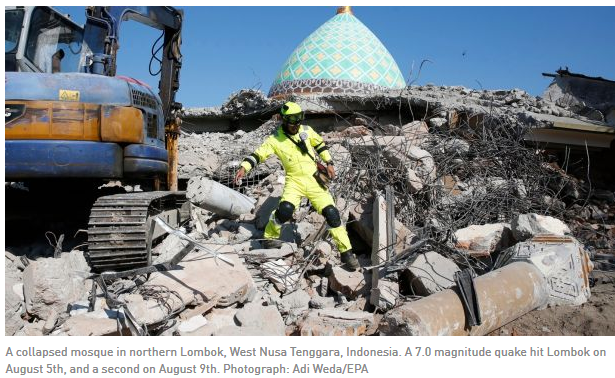 We see the pictures from Lombok Indonesia this week after a series of large earthquakes and recognise the terror of dying in a natural disaster, when the earth itself is no longer steady. Most people are afraid for their lives in a natural disaster, but your chances of dying are very small. Even in the eruption of Vesuvius in AD 79 that buried Pompeii deep in volcanic ash, 90 per cent of the victims got out alive. With the advances in engineering and building construction, our odds have gotten better. Ten years ago, I led a team at the United States Geological Survey to model with the best science what would happen to southern California in a big earthquake on the San Andreas fault. Our estimate of casualties is 1,800 dead – out of 20 million residents. The chances of living are 99.99 per cent. A Californian is hundreds of times more likely to die in an automobile crash than in an earthquake. Instead of worrying about dying in a natural disaster, you should be worried about living after a natural disaster. In all of our disaster scenarios, we found that the business disruption from lack of utilities caused economic losses over the next few months as large as what happened in the disaster itself. Before the great earthquake in 1906 destroyed it, San Francisco was the only city that mattered on the west coast of the United States. The decade after that earthquake was the largest growth decade in the history of Los Angeles, as people abandoned San Francisco and came south. The terrible Lisbon earthquake of 1755 is the largest natural disaster to have struck Europe. It destroyed most of the buildings in Lisbon and many smaller towns, killed many tens of thousands of people, permanently changed the Portuguese economy. From a major colonial power, Portugal shrank to a much smaller player on the global stage. Just about every major city in the world is at risk from natural disasters. We build our cities near the ocean that brings us trade – and hurricanes. We build near rivers for water and transportation – and must cope with the floods. The risk is growing as our cities become more complex. Modern urban life depends on systems, including communication systems, transportation systems, power grids, and water and sewage systems. Whereas only 14 per cent of the world’s population lived in cities at the beginning of the 20th century, now over half the world or almost 4 billion people live in the world’s cities. A century ago, when a sewer pipe broke in an earthquake, you dug a latrine in your backyard. In modern Los Angeles, the loss of the sewer system in an earthquake is a potentially deadly public health crisis. Systems fail where they are already weak. The damaged levee is the one that will fail in a flood. Similarly, the human systems fail at their weakest points. A community whose people know and care about each other is the one that will pull through. A community divided, whose ideas of preparedness involve procuring guns or fortified bunkers, is at risk. The future is largely unknowable. We can see patterns and assess likelihoods, but time travels in only one direction. We cannot know which of the Earth’s many cities will experience their big one in our lifetimes. But we can say with confidence that it will happen somewhere. How that city will recover will be determined by its people and how they can pull together and care for each other.